Janet Mercer was born in England and raised in a family that embraced both art and history. Currently, Janet lives in the village of Dundas where she maintains her home studio . As a contributing member of the local art community for over ten years she is often found at local events, supporting her community as well as showcasing her art. 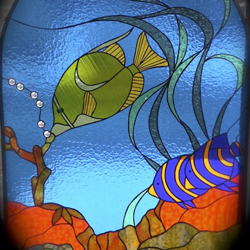 Janet is extremely enthusiastic about her work and that passion shows in every piece she creates. 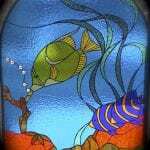 Every one of Janet’s works is hand crafted, with an attention to detail that is rarely surpassed by any other stained glass artist. From conception to completion every detail is scrutinized. Her lines or “joins” are made to be as smooth and flowing as possible. 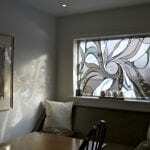 Glass is carefully selected for appropriate colour and texture to ensure that the resulting artistry connects with her audience. It is this attention to detail that has seen her work collected internationally. Observers of Janet’s work will note that she prefers not to limit herself to one style or technique. Her preference is instead to explore, and in some case, mix styles and techniques, blending the “traditional” with the “new” to create truly stunning and unique, one of a kind pieces. Her work encompasses everything from the simple and subtle to the vibrant and intricate. From the small handheld pieces that sit delicately on a shelf, to larger more grand pieces that encompass entire window bays, sunlights, sidelights and even walls. No matter how detailed and vibrant the finished piece maybe, observers will also find in her work a sense of balance and harmony.